A welcome return for a fascinating guitar. We love seeing an unsung guitar getting a second chance, because sometimes they're just not appreciated like they should be first time around. For instance, back in 2013 Fender finally gave Starcaster fanatics the comeback they were crying out for by adding it to its Modern Player series, and since then the 70s footnote has found reissued life in the hands of a whole new generation of players - including Wes Borland. 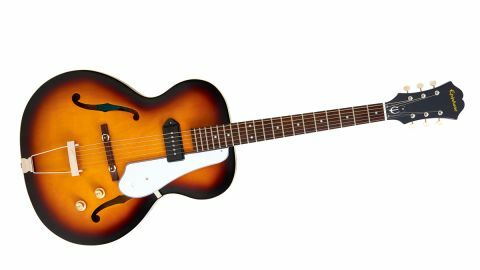 That brings us to another return, this time of a rather idiosyncratic old design from Epiphone. And like Jonny Greenwood's patronage of the Starcaster earned it a cult following, an original P-90-loaded 1966 Century has been gaining attention in the hands of a British hitmaker; James Bay. Its tones can be heard all over megahits Hold Back The River and Let It Go, but that's not all that's piqued our interest - the Century really intrigues because it seems to offer something different. The Century is a lightweight guitar and feels instantly comfortable on the strap. A tantalising crossover between the acoustic and electric worlds? We better get playing and find out. Bay plays a Cherry Century and these reissues will offer an Aged Gloss version of that finish and this Vintage Sunburst. The somewhat satin (if that's what Epiphone means by 'aged') finish on the laminated maple top is classy but understated, with amber hues blending into dark edges with waves through the grain tempting us to take a closer look. And of course, we're happy to oblige. The hardware we want to draw your attention to most here is that floating rosewood bridge - the angle of string elevation over it definitely adds a tight bounce to the tension, and we'll get to that later. The Century is a lightweight guitar (5.5lbs) and feels instantly comfortable on the strap. It's even better sat down before we plug in; because it's hollow there's a satisfying experience to be had playing away from the amp, and it has an appealing rounded woody character. All this could combine towards your heart, head and hands forming a bond with the Century, and that's always vital with any guitar, but especially so here. Because the Century lives in a world of its own. Plugged in, we're immediately encouraged to strum by the acoustic experience and the almost-neck position of the P-90 Pro rewards that with a warmth topped with an unusual compressed nature that gives the Century its own voice. Having one pickup does limit your options but will inspire you to use the other tools more; strumming away from the P-90 for softer dynamics and increased 'acoustic' texture, dropping the volume control down a notch to clean up and dialling the tone down to enter authentically jazzy archtop territory. The Pro is not the hottest P-90 we've encountered, but this is a hollowbody and feedback is a consideration. Move into medium gain and things can get wooly in the bottom end, but pitch your amp's treble right and there's ragged character for rock rhythm. Unsuprisingly, the Century is happiest strummed and picked up and down its C-shaped neck over cleaner ground, pushed with light gain in places. Trying some blues licks, we experience that tension from the bridge design and the wound G string. Whole tone bends aren't given for free (we find it friendlier in Eb) but it inspires more muscle from your approach. This really is an unusual guitar - it is essentially an acoustic with a P-90 wired in - and could offer a new muse for those who are hitting the wall with an acoustic, onstage or writing. A singer/songwriter frustrated between the worlds of unplugged intimacy and rock power could find their tonal catalyst here; a different voice. And for that alone we welcome the return of the Century.